knew exactly where their brothers and sisters were. After many months of observation, the boy concluded that the eels churned the pond’s water to create confusion among its other dwellers the frogs, salamanders and small fish. And confused, they became tiny morsels easily plucked. The eels ate only what they needed and their water dance never disturbed anything other than the water’s surface. The little pond was fed by a small stream. One night, while sitting in his favorite place, the boy noticed that the water was not boiling but rather frothing in a more than violent manner. He leaned over the edge to try and gain a better look at the frenzied waters. With his face just inches from the surface, a large lean head full of teeth reared up from the dark. Pulling back, the boy just missed being bitten. An eel had attacked him. An eel new to the pond for its head was far too large. His friends, for he did consider the little eels friends, had never shown any aggression towards him. They actually had curled around his hand when he would dip an arm into the pond. These eels were new and did not respect the pond’s order. They roiled up the muck from the bottom, masking anything under the water. the outside by following the little feeder stream. If his pond were to be saved, he then would be the one to take action. The boy ran to his home in the tree and found his fishing net. It was long enough to stretch across the pond from shore to shore and still reach bottom. But, without weights, it would only float on top. For his purposes, the boy needed to sink the net’s bottom. And for this, he had the perfect solution, the carved stone chess pieces given to him by his father. The boy took first the pawns, then the military, church and finally the royalty, tying each to the net’s bottom with his strongest knots. They were just heavy enough to pull the bottom edges into the pond’s depths. The boy then took the net and dropped its weighted end into the pond across from its feeder stream. Then, with one side of the net tied to his tree, he began to pull the net slowly through the water like a canal lock. His plan worked. The weave of the net was too small for the large eels to swim through, yet a big enough escape for the small eels, frogs, salamanders and fish. The boy drove the larger, clumsier eels across the pond to the feeder stream and with a few stakes in the ground, fenced them out. The next morning, the boy saw the pond was clear once again. The net had done its job bringing order back to his little piece of the world. But, he did notice the larger eels waiting behind the net. They looked longingly into the pond with all its tasty morsels. The boy knew that as the steward of this tiny pond, it was his job to maintain the barrier keeping out those who did not belong. He also must never hinder the water’s flow – a balance necessary to avoid obliteration. It is not just because of the relevance I have posted these three memories but Moses has been too busy to post anything himself. We are close and I hope soon he will let everyone know what he’s been up to soon. When I think of reptile houses, I think of zoos not some building off a dusty roadside east of Amarillo, Texas. Hand painted billboards promising “Biggest Reptile House in Texas,” and “Stop in and see a pit filled with over a thousand snakes, “ littered the roadside. It advertized itself as having the largest concentration of poisonous snakes in the continental United States. Oliver had to see it. We followed the signs that led down a two lane road. The building was long, a single story with bright red trim. There were hand painted signs the size of cars depicting overly large and extremely viscous looking snakes. Not one accurate rendering but all had a nice sense of blood lust. Before I could turn off the motor, Oliver was out of the car and running to the entrance. I was still concerned about his reaction to Dinosaur World the day before. But little boys do not worry about the same things their mother’s do. He wanted to see snakes. They were cool. I paid the admission and we entered. The room inside was long with three walled pits, one on either side, the largest in the middle. 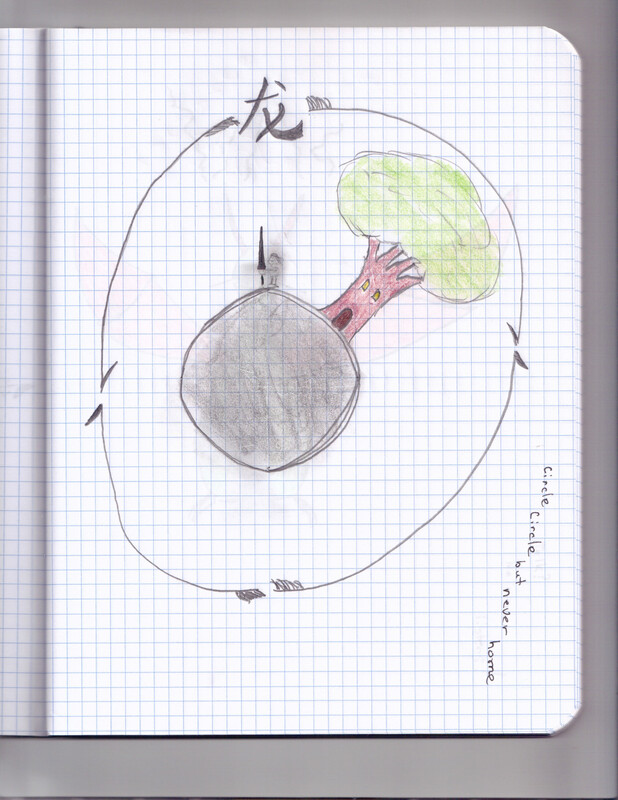 Centered above the middle pit hung a stuffed two headed monkey dangling from a string. Oliver stopped and stared. Mystery solved and Oliver ran over to the pit. We looked over the edge and saw the bottom covered in snake. It was a mass of slithering bodies. The site actually made me a bit light headed. I don’t like snakes. Oliver pointed and said, “How cool is that, Mom?” It was a precious moment because I remember him so happy and engaged. We looked at the other two pits and saw basically the same thing, snakes all twisted up together. We walked along the walls looking in cages filled with lizards, huge spiders, and of course more snakes. There was no one else in the building except the ticket taker. We had the place to ourselves. “You may want to go look at the center pit. Feeding time,” the ticket taker told us. So we looked over the edge once more. A door in the wall slowly opened and a man pushed the snakes away with a hooked pole. He wore some type of thick waders that the snakes could not bite through. This didn’t stop them from trying. He had a large bucket hanging from his arm. This was lunch. The man took the bucket and tossed live mice towards the middle of the pit. Using the pole, he pushed snakes out of his path and left through the door. At first, there wasn’t much to see, writhing snakes with this mass of white mice in the middle. Then one mouse just disappeared. And then another. The feeding frenzy began. I have never seen anything as fast as those snakes striking their prey. Oliver thought it was the coolest thing. That is until he watched one mouse closely. We saw the life just leave the little things eyes. I was afraid this was going to upset Oliver. He just turned and walked towards the door. “That was gross,” was all he said. “Yes,” and I left it at that. Yes, my perceptive little boy had an interesting analysis of the situation. The snakes just wanted to go home. Like Moses and if he is correct, like Oliver, they just wanted to go home. Not all of our adventures had deep meaning or melancholy endings. These three stick out like talismans. I don’t know if they have meaning. I just want my son back. 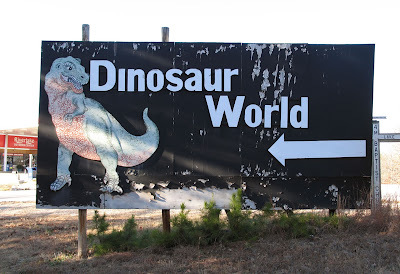 Now abandoned, Dinosaur World was a must see for my son. It was a perfect marriage of Dinosaurs and kitsch. Located near Beaver Springs, AR, it was a hodge podge of brightly colored concrete reptiles and cavemen. Even Oliver saw there were no facts behind any of the exhibits. Badly molded cavemen stood in a wooden tower menacing the parking lot below as we drove in. Why relate this memory over the taffy pulls, petting zoos, digging for diamonds or Cadillac Ranch? Because I watched my son run from one tacky exhibit after another looking for something. I don’t think he even knew what he searched for. I let him cross the rope bridge suspended over water. Thinking back, I’m not sure it was even safe. But I wanted to see my son have fun and that he did. Oliver walked out to the middle, looked both ways making sure he was alone before shaking the bridge back and forth. He wanted to see how far he could move it and how scared he could make me. I was but didn’t show it. I didn’t want to give him the satisfaction only to have him try something more death defying. Then he found this big green dinosaur. I couldn’t tell you if it was supposed to be a T-Rex or a Spinosaurus, its ferocity almost comic. Oliver stood ten feet in front of it, staring up into the painted eyes. The claws were spread in an attack behavior but the statue was anything but menacing. Yet, my son stood transfixed. And just as quickly he was ready to leave. We walked back to the main gate in silence. I thought about asking Oliver if everything was alright but decided against it. I could sense he just wanted to be with his thoughts. At the snack bar, we shared a Kong Burger and French Fries. Actually, I ate a few bites and Oliver played with the fries. Finally I asked if he was alright. Oliver said he wasn’t sure. He was afraid but didn’t know why. He felt “fuzzy” and there was a ringing in his ears. He didn’t want to go to see a doctor. He said it was already gone. I made him promise to let me know if this feeling came back. He promised. And that was it. I tried to ask him about it later at the hotel but he said he didn’t know. It was just a feeling and the feeling was gone. I didn’t push. The remake of King Kong was on television that night. I find it now a synchronous event. As I later learned, Dinosaur World was originally named Land Of Kong and was somehow connected with the actor John Agar who was in the 70’s remake of the film. Is there anything relevant about that roadside stop? Who’s to tell? In Moses’ dreams, my son battles dragons. He felt “fuzzy” with a ringing in his ears similar to what I felt the day he disappeared. Maybe I too am looking for relevance in simple coincidences.